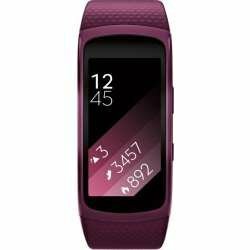 Samsung Gear Fit 2 Fitness Activity Tracker Made for all the ways you work out, the swim proof Gear Fit2 Pro helps you stay motivated, maintain a healthy lifestyle and achieve all your fitness goals with or without your phone. Partnered with Under Armour to give you apps that help you track more kinds of exercise, balance your diet and challenge your friends. You can also capture routes with built in GPS tracking and get an all day look.